We’ve never heard of a Chanukah cocktail party, so we decided to throw one this year. All of these are simple: no complex or time-consuming mixology. 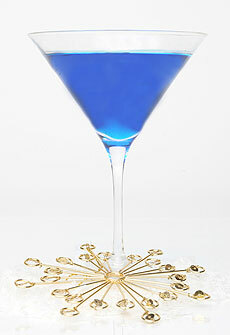 For a standard Martini, add food color to the bottle of vodka or gin. For a fruit “Martini,” mix with blueberry juice. You can also use citrus-infused vodka; but note that these sweet drinks are not Martinis. A Martini is a savory drink made with vodka or gin plus vermouth (Martini history). For a darker blue, add a drop of blue food color. You can add more curaçao, but that adds more sweet orange flavor. Orange-flavored vodka plus curaçao make this a nicely orange sparkler. 1. RIM the champagne flutes with sparkling sugar. Add 1 ounce each orange vodka and blue curaçao into each. 2. TOP off with sparkling wine. Stirring isn’t necessary but if you want to blend, use one brief stir so the bubbles don’t pop. 1. RIM a champagne flute with honey and orange sugar. 2. ADD the curaçao and vodka to a champagne flute, and top with sparkling wine. NOTE: Sparkling sugar is available online, at baking supply stores and at craft stores like Michaels or Hobby Lobby. 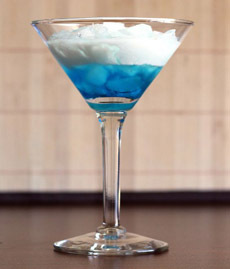 Blue Martini (photo courtesy SKYY Vodka). [2a] Blue Sparkler (photo courtesy Announcing It). The Chanukah Candle, a sparkler with a bit of honey and gold or orange sparkling sugar (photo courtesy Living On Cloud Nine). 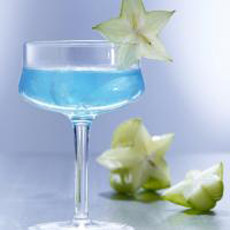 Blue Star, with a slice of starfruit (photo courtesy Recipe Plus). 1. PLACE the ice cubes in a cocktail shaker. Add the curaçao and grapefruit juice and shake well. 2. STRAIN into a cocktail glass and top with sparkling wine. Garnish with the star fruit. *The Star Of David is a six-point star, but we only have what nature provides: the five-point star of the carambola (star fruit). Mazel Tov Margarita (photo and recipe courtesy Host The Toast). Turn a White Russian into a Blue Russian by substituting blue curaçao for the coffee liqueur (recipe and photo courtesy Mix That Drink). 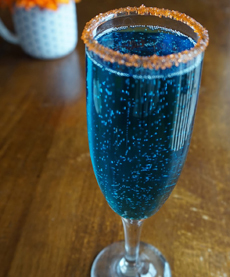 Put a sparkling sugar or coconut rim on a blue soft drink (photo courtesy Garlic My Soul). The classic Margarita is made with orange liqueur, originally Cointreau but often the less expensive generic orange liqueur, triple sec. Curaçao is another orange liqueur, from the Caribbean. 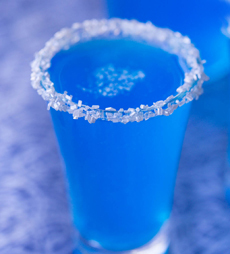 It is a clear liqueur; but years ago, blue color was added to create blue curaçao for more festive cocktails. 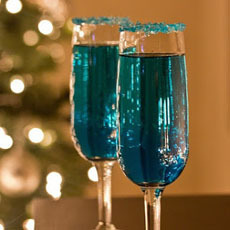 Per Host The Toast: “We find the flavor of the blue a little more bitter, so we’ve balanced the drink by using half blue curaçao and half triple sec.” Try it both ways, to see which you prefer. Here’s how the different types of orange liqueur differ; from curaçao and triple sec, which are generic terms, to brands like Cointreau, Grand Marnier and Gran Gala. 1. CREATE a salt rim on a margarita glass, mason jar or other glass: Rub the rim with a cut lime and dip and twist the glass in a shallow dish of coarse salt until the rim is coated. Place the glass in the freezer for a few minutes to chill. 2. COMBINE the drink ingredients in a cocktail shaker filled with ice and shake well. Pour into the chilled glass and garnish with a wedge of lime. 1. ADD two or three crushed ice cubes of ice to a martini glass or rocks glass. 2. ADD the curaçao, followed by the vodka. Top off with the cream. Curaçao is an orange liqueur made from the dried peels of the laraha (LA-ra-ha) citrus fruit, grown on the island of Curaçao in the Netherlands Antilles (southeast of the Virgin Islands in the Caribbean). The laraha is a de-evolved descendant of the Valencia orange, which was brought over from Spain in 1527. It did not thrive in the Southern Caribbean climate. The oranges that the trees produced were small, fibrous, bitter and inedible. The trees were abandoned, and the citrus fruit they produced evolved from a bright orange color into the green laraha. When life gives you bitter fruit, distill it! It turned out that while the flesh of the laraha was inedible, the dried peel remained as aromatic and pleasing as its cultivated forebear. Experimentation led to the distillation of Curaçao liqueur from the peel. The distilled liqueur is clear. 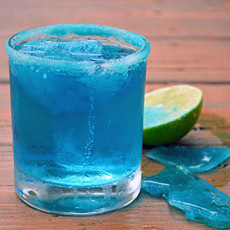 Some brands are colored blue or bright orange to create color in cocktails. The color adds no flavor.